The director of the Art Gallery of New South Wales, Dr Michael Brand, today announced the launch of the new National Art Archive at the Gallery to coincide with the gifting of material from the Biennale of Sydney’s archive. The Art Gallery of New South Wales has been Australia’s leading collector of visual arts archives since its foundation in the 1870s and the formal establishment of the National Art Archive recognises the depths of these collections and a commitment to making them more widely available for research and learning. The gifting of the Biennale of Sydney Archive will bring a strong international contemporary art focus to the National Art Archive, which currently holds the personal papers of over 220 artists, the business records of over 50 commercial galleries and a large collection of artist painting materials and related artefacts. The two organisations have had a continuous association since 1976 when the second Biennale was staged exclusively at the Art Gallery of NSW. 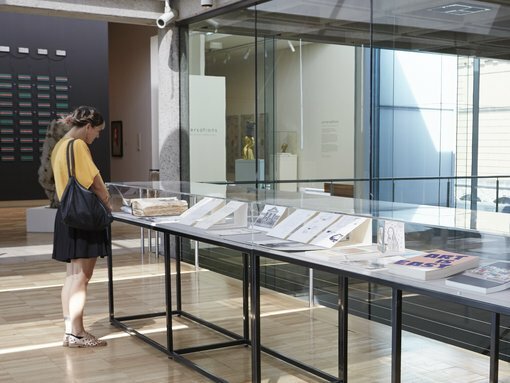 Dr Brand said the Art Gallery of NSW will now work with the Biennale on an historic archiving project led by the Gallery’s archivist, Steven Miller, delving into more than 1000 archival boxes that make up the physical archive of the Biennale of Sydney. “The Biennale of Sydney Archive includes rich artists’ files, images, correspondence, media clippings and photographic and video documentation that stretch back to the organisation’s inception in 1973,” Dr Brand said. “We are honoured to incorporate this archive reflecting the key historical, political, social and cultural aspects of the Biennale – and indeed this city – into our National Art Archive,” Dr Brand added. The Biennale of Sydney Chair, Kate Mills, said the Biennale of Sydney Archive is the most comprehensive archive of national and international contemporary art activity in Australia and includes records from nineteen editions of the event. “The first Biennale of Sydney was held as part of the opening celebrations of the Sydney Opera House in 1973. It was the first biennial established in the Asia-Pacific region. Over 1700 artists from more than 100 countries have participated in the 19 subsequent editions of the Biennale,” Ms Mills said. “The Biennale has since grown to become one of the great cultural events hosted in Australia and we’re very much looking forward to hosting the 20th Biennale of Sydney in 2016 during which the Art Gallery of NSW will be transformed into the Embassy of Spirits,” Ms Mills added. The Biennale of Sydney Archive project will be undertaken over the coming years with materials being digitised and key moments and narratives being explored. Significant materials in the archive will be made available to the public through the Art Gallery of New South Wales and Biennale of Sydney websites. The addition of the Biennale of Sydney Archive to the National Art Archive provides tremendous opportunities for artists, students and academics for research purposes. Ms Mills said the Biennale of Sydney proudly recognises Transfield Holdings as the Biennale’s founding partner and applauds the role the company played in the Biennale’s history and in the creation of the Biennale of Sydney Archive. “Today we celebrate the vision of Franco Belgiorno-Nettis in establishing the Biennale of Sydney, and in recognition of 40 years of previous support, the Biennale of Sydney will continue to acknowledge Transfield Holdings and the Belgiorno-Nettis family as Founding Patrons,” Mills said. The National Art Archive at the Art Gallery of NSW is the largest art archive in the country and currently holds the histories of over 220 artists including those of Margaret Preston, John Coburn, Max Dupain, Roy de Maistre, Margaret Olley, Tony Tuckson, Michael Riley and the recently gifted Colin Lanceley archive. Dr Brand said the National Art Archive reflected the Art Gallery of New South Wales’ purpose of serving the widest possible audience as a centre of excellence for the collection, preservation, documentation, interpretation and display of Australian and international art, and a forum for scholarship, art education and the exchange of ideas. “The Gallery is a national leader in art scholarship and this position is underlined by the close and continual maintenance and development of our art archive. The Gallery recognised the significance of its archive over 20 years ago when it was the first public art museum in Australia to appoint a professional archivist, Steven Miller, and more recently this year appointed the first archivist of Aboriginal and Torres Strait Islander material, Shari Lett,” Dr Brand said. “The National Art Archive at the Art Gallery of NSW is an archive of international standing. The size and scope of the archive’s collection is currently similar to that of Tate, London. “The National Art Archive has a bright future as the Gallery moves towards its Sydney Modern vision of establishing a truly 21st-century museum which is both engaged with our past while offering new and expanded ways in which to understand and enjoy art,” Dr Brand said.